Preheat oven to 425 degrees. Combine water, butter, and salt into a med saucepan and bring to a boil. Remove from heat, and add the flour all at once. Whisk vigorously for a few moments, stirring constantly until the mixture has thickened and is pulling away from the sides of the pan,a minute or less. Stir in 4 eggs one at a time, making sure the first egg is fully incorporated before adding the next. Then stir in the cheese and the scallions. Line a shallow baking sheet with parchment paper or a Silpat liner . Drop the batter by the tablespoon onto the baking sheet, spacing the puffs about 1 inch apart- with your hands lightly dampened you can smooth them out some. 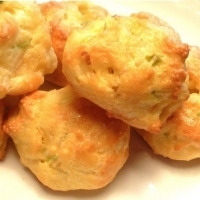 You can make petit gougere-using teaspoons- and reduce the cooking time. Beat the remaining egg with a teaspoon of water in a small bowl. Using a pastry brush, lightly brush the tops with the egg. Sprinkle lightly with grated gruyere. Bake for about 20 minutes on center rack,until the gougeres are puffed and golden brown- they should sound hollow when tapped. They can be made a few hours in advance and reheated at 375 degrees for about 5 minutes. They freeze well- just thaw and reheat in a 375 degree oven again for 5 minutes or until heated through.